Previously sold in our New York Rooms, 24 September 2004, lot 83. The mark written in Manchu may be read, Manju ambal/wehiyehe abkai jakuci (?) aniya, which may be translated, 'Eighth (?) year of the Qianlong reign of the Great Qing (dynasty)'. The poems on the vase describe the 'Southern Imperial Garden', and the finely carved scenes on the vase may depict one of the rare visits of Xiwangmu, the Queen Mother of the West, to the sages and emperors in the Middle Kingdom. The peaches carried by the attendants would then refer to the peaches of immortality which were grown in Xiwangmu's garden. 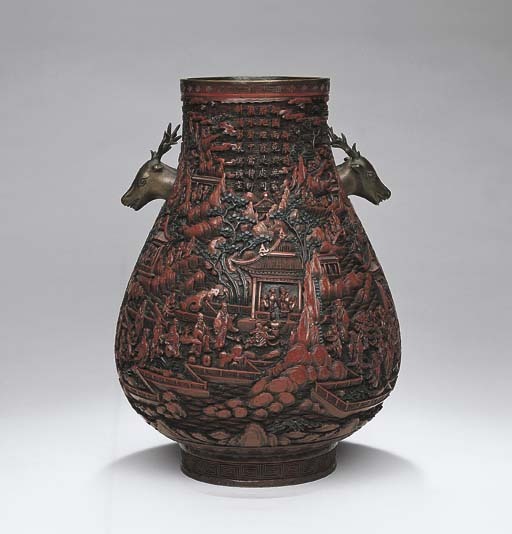 A dark red lacquer hu carved in similar style with equally rich scenes of the Feast of the Immortals on Mount Kunlun, which was also attended by Xiwangmu, was sold in our New York Rooms, 24 March 2004, lot 14. Like the present hu, it has bronze animal-head handles, in the shape of elephants, and a Qianlong six-character mark inscribed on the metal base. Another related pair with garlic-head mouths was sold in these Rooms, 26 April 1998, lot 570.